While this question isn't for a Bu, the knowledge on here always amazes me and I find it the most trustworthy around, so I'd like to know your thoughts. I just bought a new to me Sea Doo, 2000 Carborated GTX. It has the 951 engine in it with 106 hours. It seemed well taken care of with a list of regular maintenance receipts. The engine seemed felt strong and compression tested at 125 and 129 (should be 135 new), so it seems pretty good. The engine bogged a little and seems to be running rich so I will end up adjusting the carbs and cleaning up a few things. I started with cleaning up the power valves (RAVE valves) and found them very dirty and the entire module unhooked (the air hose came unhooked). That could be the reason for the bogging at lower RPMs. While cleaning them, I looked in the cylendars and found something strange. There looks to be a chip out of the bottom ring. This is my concern. Am I right that this is a chip? I know it's not the ring ends because even if the piston was in backward it would be more toward the side of the opening and the gap would be smaller. What should I do with this now? Do I need to replace the rings? Is it just carbon build up and that spot came off? I'd love to hear your thoughts. Based on the picture, it does look like a chunk missing out of the ring, which could be just enough to get the lower compression reading you tested at. The dirty reed valves and unhooked intake boot would definitely cause the bogging issue (had this happen on a snowmobile). Looks like you might have the engine tore down a little already, so I would go ahead and replace the rings while you have it apart. Check the cylinder to make sure that missing chunk didn't score the cylinder. I'm not familiar with those engines, so I'm not sure if you can simply replace a sleeve, or you have to replace the whole jug if it did mess up the cylinder wall. that gap isn't the bitter end(s) of the ring (which allows it to be compressed to the cylinder id), is it? No. The ring end gap would be on the back side so you can't see it. The dirty reed valves and unhooked intake boot would definitely cause the bogging issue (had this happen on a snowmobile). The valves I cleaned were the RAVE valves not reed valves. The RAVE valves change the size of the exhaust ports in order to give more torque depending on the engine RPMs. Air pressure from the case is used to open and close the valves but mine slipped off. We'll see how much better it runs soon. I didn't really have much of the engine torn down (just pulled the RAVE valves). I just spoke with a mechanic I trust and he said that if I'm going to get in there to replace the rings, I may as well do a full top end job (pistons and bore). As we discussed it, we decided since it's running fine, I should just leave it for now. If the ring goes, it wont me much extra work than preemptively doing the work. It may cause heavier scoring on the cylinder walls. I think it's worth the risk comparing the different options. Change the rings out now without a full top end. $300 cheaper than the full top end, but I'll need a top end in the next few years anyway. I would pretty much guarantee that at least the rings wont go. Do a full top end now. Then I'll have an engine that's in good shape and I shouldn't have to worry about it. Although, I don't really care about the reliability since we have plenty of toys and never go very far from home. Ignore it, and it runs fine. I'll do a top end job in a few years as the compression goes down. Ignore it, and the ring goes. I'll have to do a top end job and possibly re-sleeve instead of just bore. Not a ton more money than option 2. Just my opinion, but it really looks to me like that is the standard gap on the rings. If you look at the ends, it appears that they are both chamfered at a 45 angle in the same direction. I find it odd that a chip would produce such a uniform break. And if that weren't the standard gap, that means the ring is now in two pieces. If that were the case you'd have some very serious damage to the cylinders from scoring. The rings can spin on the piston so it's not like the gap always stays in the same position relative to the piston. I wouldn't dismantle the engine unless you start to really see problems. Give it a shot with the cleaning you did and fix to the you made. On these pistons, the rings can't rotate. There is a bump in the ring groove at the point of the rung gap to prevent this, and therefore the rings stay at the back of the piston. The reason they don't want the rings rotating is because on a 2-stroke engine there are exhaust and intake holes in the sides of the cylinders. If the ring ends come in contact with those holes, they will catch and tear the rings out. I can pretty much guarantee it's not the ring gap. Your illustration is helpful though. 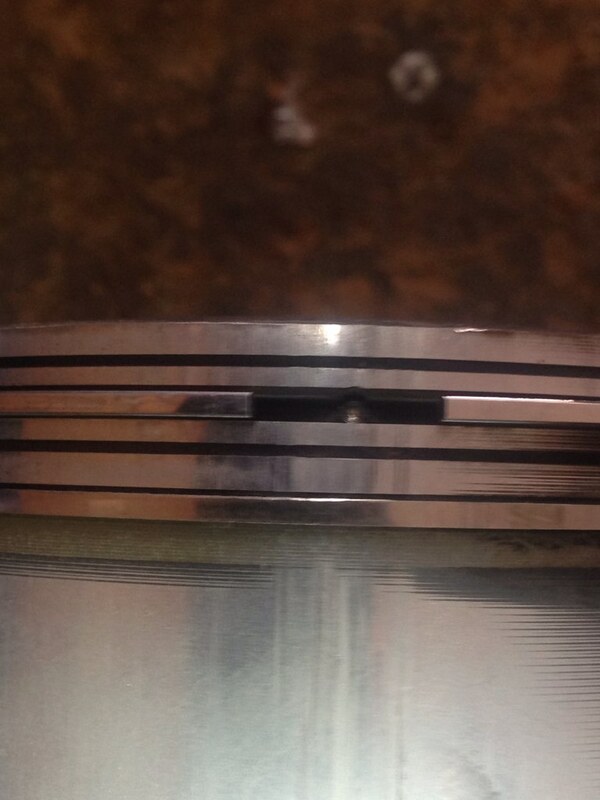 Since the angles are both going down, it does look like the chunk was taken out while the piston was moving up. While the chunk could increase the risk that it could happen again, or the ring could break, I'm willing to take that risk for now. The rings can spin on the piston so it's not like the gap always stays in the same position relative to the piston. I wouldn't dismantle the engine unless you start to really see problems. Give it a shot with the cleaning you did and fix to the you made. For what it's worth, I let the rings go on a CR 250 I had when I was younger. Rather than just replace the piston/rings/gaskets on schedule, I figured "eh, it'll be ok". Well long story short, I was wrong. I started getting piston slap which took out the Nikisil sleeve lining that most newer 2strokes have. Putting a new sleeve in, like you can with car engines, wasn't an option. I had to buy a whole new jug, which was MUCH more expensive than had I spent the $200 or so in the first place to do the top end. I understand you aren't really worried about it, but just my $.02. Learn something new everyday. The 89 Kawasaki 650 stand up I had didn't have the bumps like that. I was running aftermarket pistons so maybe that had something to do with it. Good discussion here, I don't disagree with the points called out about the ring retainer keeping the rings lined up. I've seen 2 cycles with and without the retainer(has anyone ever seen it on a 4cycle, I haven't....). I came to the conclusion that the perfectly perpendicular chip with 45 degree chamfer on both sides was just too coincidental. I like your very well thought out diagnosis/plan below, and it all makes sense. As mentioned in my other post though, if that really is a chip and the real ring gap is on the other side, that ring is most likely going to fail soon. I can't see it living long under the high rpm lives these motors live. Hopefully it's a simple failure and not too catastrophic. what does the rest of the piston skirt look like if you rotate it past the ring? If you're getting lots of blow-by, you're asking for future trouble. I'd get a leak-down test on it personally. Rotax engines with single-ring pistons are a nightmare BTW, especially on sleds in the '00-05 vintage. The rest of the piston skirt looks perfect. I will run a leak down on it as you suggested. 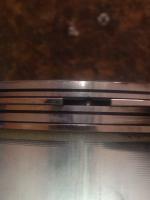 This is a dual ring piston.You can just see the shiny ring at the top of the opening in the picture. Rings are pined on two strokes so the end gap are held away from the porting. If I opened it up I would do new rings nothing more. Set ring gap and go. As long as I did not see other damage. I think I'd run a bunch of decarbonizer through it and then take a look at that ring again. That's a good photo, but it's kind of hard to see exactly what's going on in there. No matter what, the engine needs to be decarbonized.